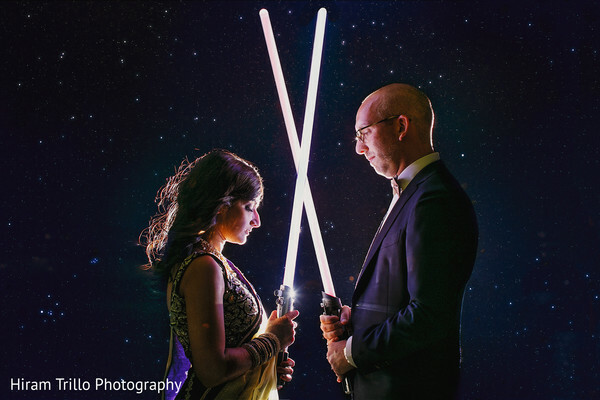 The force was totally with Archana and Jim’s evening shindig that struck the right balance between funky and elegant. Thanks to the brilliance of K.I. 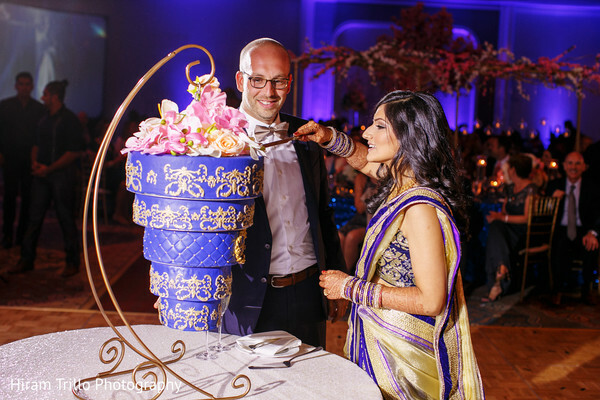 Weddings, and the expertise of Decor One, the soiree incorporated elements of Star Wars via light sabers and a romantic midnight theme. 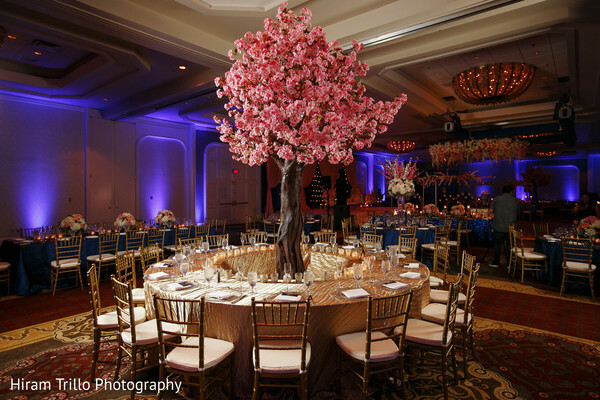 While Decor One was unrestrained when it came to florals, they were careful not to go overboard given the richness of the colors used. 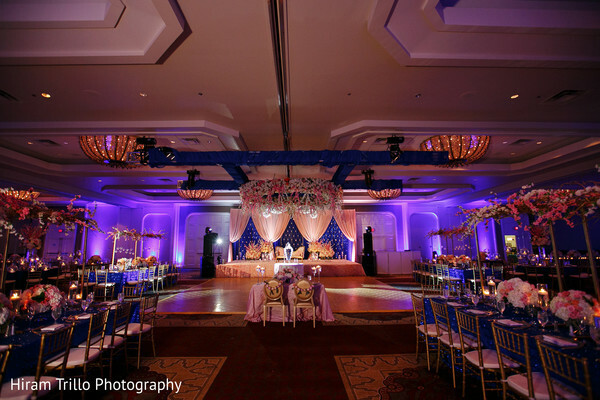 A midnight blue metallic backdrop was offset with blush coral drapes. The tables and centerpieces were adorned with gorgeous pink and white blooms. One of the many highlights was the inverted royal blue cake by Celebrity Cafe & Bakery, clearly a design masterpiece. In keeping with the theme, Archana opted for a sumptuous velvet lengha in navy, featuring a cutwork gold border that was to die for! 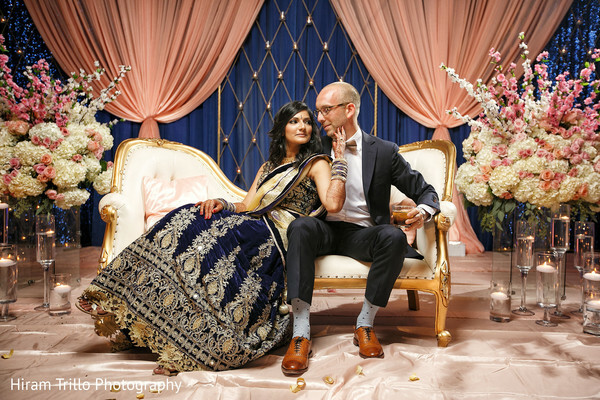 Something we had never seen before was Jim’s gold bow tie, that worked so wonderfully with his charcoal suit, and his Maharani’s navy and gold ensemble. The night of lightsaber dueling, Bollywood dancing, and a bucketload of fun came to a close with DJ Prashant Poudyal setting the dance floor on fire with his hit mixes! These photos from Hiram Trillo Art Photography are simply out of the world, and you can check them all out via our gallery. Hump Day? What is that? 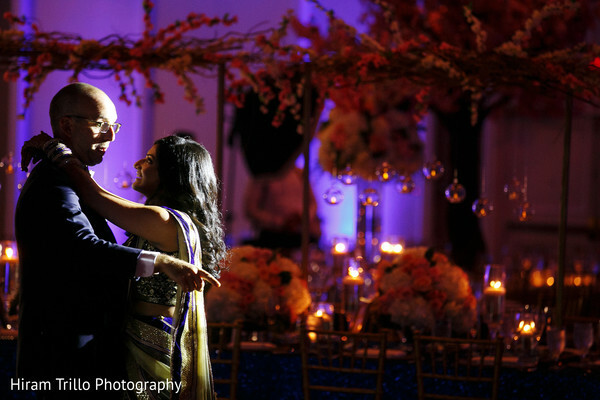 Archana and Jim’s fabulous wedding bash took away all our midweek blues and only left behind a ton of inspiration. 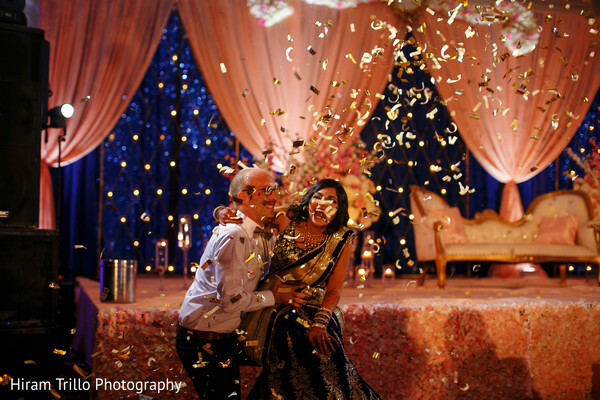 Indulge in more such gorgeousness by visiting our blog tomorrow! K.I. Weddings, Draped2Nines, Hiram Trillo Art Photography and Dessert Station - Dandelion Cheesecakes are members of the Platinum Guide. Love what you see? Explore their portfolios.